AV Cable Type: Audio/Video Cable. 1 xComponent AV Cable. Connect to your HDTV (High-Definition TV) or EDTV (Enhanced-Definition TV) and enjoy the most stunning graphics available. Cable Length: 6 ft. No exception. Connect to your HDTV (High-Definition TV) or EDTV (Enhanced-Definition TV) and enjoy the most stunning graphics available. AV Cable Type: Audio/Video Cable. 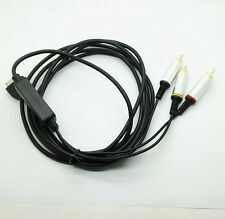 1 x Component AV Cable. Connect to your HDTV (High-Definition TV) or EDTV (Enhanced-Definition TV) and enjoy the most stunning graphics available. AV Cable Type: Audio/Video Cable. 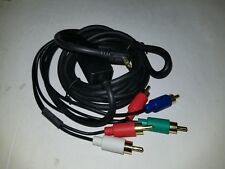 1 x Component AV Cable. Cable Length: 6 ft. If a display is used which does not support the NTSC video format, no picture will be displayed. Check with the TV manufacturer for detail. Provide composite video & audio output for viewing on a TV or monitor. New ListingKMD AV TV Cable for Sony PSP Slim 2000/3000 Brand New Sealed!!!! 4 out of 5 stars - KMD AV TV Cable for Sony PSP Slim 2000/3000 Brand New Sealed!!!! 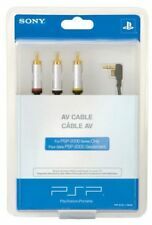 21 product ratings21 product ratings - KMD AV TV Cable for Sony PSP Slim 2000/3000 Brand New Sealed!!!! AV Cable Type: Audio/Video Cable. 1 xComponent AV Cable. Connect to your HDTV (High-Definition TV) or EDTV (Enhanced-Definition TV) and enjoy the most stunning graphics available. Cable Length: 6 ft. Otherwise deal is final. Connect to your HDTV (High-Definition TV) or EDTV (Enhanced-Definition TV) and enjoy the most stunning graphics available. Ultra thick and flexible PVC jacket with color coded connectors help to simplify installation. Connect to your HDTV (High-Definition TV) or EDTV (Enhanced-Definition TV) and enjoy the most stunning graphics available. 1 x Premium Component AV Cable. Premium Component AV Cable. Connect to your HDTV (High-Definition TV) or EDTV (Enhanced-Definition TV) and enjoy the most stunning graphics available. AV Cable Type: Audio/Video Cable. 1 xComponent AV Cable. Cable Length: 6 ft. Detail Image. Audio / Video to TV. See Photos for Details. BEFORE BUYING AN ITEM, CHECK FOR REGION COMPATIBILITY. ITEM OPERATIONAL/AUTHENTIC UNLESS STATED OTHERWISE. Lighting may hide certain defects such as tears, scratches, blemishes, dents, etc. We will try our best to properly detail condition using both PHOTOS AND TEXT. Trending at $3.50eBay determines this price through a machine learned model of the product's sale prices within the last 90 days. Trending at $6.48eBay determines this price through a machine learned model of the product's sale prices within the last 90 days. 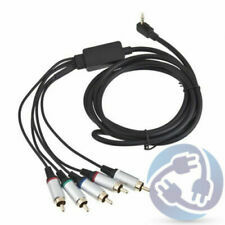 Item:Sony PlayStation Portable - Component Audio/Video TV Cable. Format/System:Sony PlayStation Portable. You can also do it over the counter at your local bank. Are you interested in this item but think the price might be a little bit too high?. High Quality Cable. Gold plated connectors for superior signal transfer. 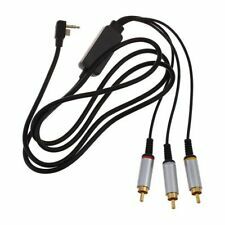 For superior quality picture, colours and sounds with high quality gold plated connection for distortion-free picture. Nintendo Wii U. 1 x Premium Component AV Cable. Provide composite video & audio output for viewing on a TV or monitor. If a display is used which does not support the NTSC video format, no picture will be displayed. Check with the TV manufacturer for detail. For more details about compatibility, refer to the online user's guide. Connect to your HDTV (High-Definition TV) or EDTV (Enhanced-Definition TV) and enjoy the most stunning graphics available. AV Cable Type: Audio/Video Cable. 1 xComponent AV Cable. Cable Length: 6 ft. Ultra thick and flexible PVC jacket with color coded connectors help to simplify installation. Enables AV output via component. Type: Component Cable. 1 x Component Cable. High quality connectors ensure optimum video and audio signal transfer. Due to the light and screen setting difference, the item's color may be slightly different from the pictures. Enables AV output via Component. 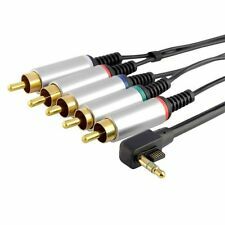 - High quality connectors ensure optimum video and audio signal transfer.